The new White Paper was presented at Hannover Messe this week. This white paper describes a concept for the automatic certification of Industry 4.0 production modules. It was presented at Hannover Messe this week for the first time. The aim is to provide greater flexibility when changing machine groups. Changes to the machine group are accepted as safe (machinery directive) if the individual components have the safety profile expected for the overriding protective function in which the safety functions are described and are implemented by all machines in the group. If there are machines in the group that have not yet implemented the required profiles, or if these profiles are obsolete, they must be revaluated manually. These are stored in the asset administrative shell and will be available to the machine group in the future. The thoughts presented in this white paper on automatic conformity assessment and its exemplary use case provide an impulse for the implementation of the concept in practice. SmartFactoryKL working group 1 “Smart Infrastructure” developed this topic. 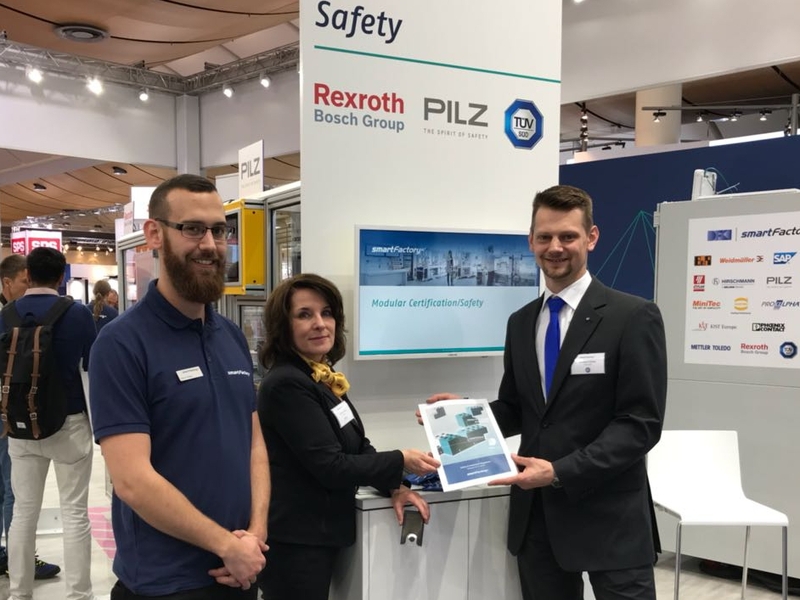 Responsible for the result are representatives of the partner companies Bosch Rexroth, Phoenix Contact, PILZ and TÜV SÜD.